One of my all-time favourite holiday dishes is Sweet Potato Casserole. And thanks to ohsheglows.com, I’ve discovered a new recipe that blows my old, very rich version (which contained a whole cup of butter and sugar) out of the water. This modern holiday classic recipe is lighter and healthier yet equally delicious. Start by cooking five big sweet potatoes or yams in boiling water for about 20 minutes until soft. In the meantime, prepare the topping. You’ll need chopped pecans, almond meal, oats, coconut oil, butter, cinnamon and maple syrup. Mix those ingredients together and set aside. Once your potatoes are soft, mash them with maple syrup, butter, coconut oil, cinnamon, nutmeg, vanilla and salt until smooth. 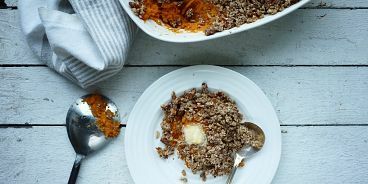 Add this to your casserole dish, top with your delicious nutty topping, bake for about 15 minutes and serve with a dollop of Earth Balance Spread. Sound good? View the full recipe on ohsheglows.com here.